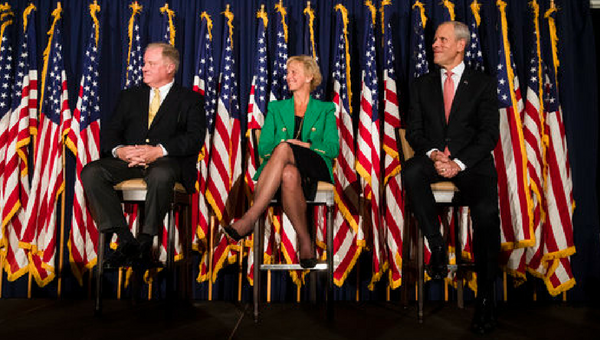 Candidates from left, seeking the Republican Party’s nomination to challenge Democratic Gov. Tom Wolf’s re-election bid next year, Pennsylvania Sen. Scott Wagner R-York County, Laura Ellsworth and Paul Mango. Pittsburgh attorney Laura Ellsworth, Pittsburgh businessman Paul Mango, and state Sen. Scott Wagner (R-York County) are running for the Republican nomination to oppose Gov. Tom Wolf, a Democrat. All of them support increased Marcellus Shale gas development, along with new pipeline construction and manufacturing plants like Shell’s ethane cracker. Their comments from the campaign trail and formal debates show how the three candidates differ, or don’t differ, on climate change, pipelines and a severance tax on natural gas, which Wolf has proposed. Their responses have been edited for space and clarity. We asked the candidates how they would use their office to address climate change. Both Ellsworth and Mango pointed to natural gas production as a way to reduce carbon emissions globally. Mango also supports renewables. Wagner wouldn’t answer our question. Ellsworth: So much of what is done around climate change is done for symbolic reasons and it is profoundly disruptive of people’s lives. …There are things that we can and must do to protect our environment. And I think they can be done in ways that are mindful of the fact that there are real human beings and families whose lives are going to be disrupted by that. And so we need to consider the environment and the human beings at the same time and make sure that the changes we make are made in an incremental way where those people can continue on in productive careers and lives while we have a sound environment and address climate change issues. As you know (natural gas is) one of the cleanest forms of energy, and… not only will provide jobs [and] economic development, [it will] completely transform the state of Pennsylvania, completely. It will also help our environmental condition. Mango: I think the government has to play an important role. We need to balance and promote innovation to ensure that we can use the cleanest energy possible. … And when you look at what’s happened over the last 10 or 15 years, and not just in Pennsylvania but the United States, most of our carbon emission reduction has come from an increase in the use of natural gas. … We can’t get to the Paris or Kyoto treaties without using a lot more natural gas instead of higher polluting fossil fuels. So I believe that we can continue to promote a sound, safe, clean environment and have the energy we need at the prices that Pennsylvanians can afford. So I’m very supportive of continuing to cultivate our natural gas industry. I think alternative sources of energy are, first of all, an important part of our future. Second of all, the innovation has been substantial over the last ten years just in terms of solar panels and wind turbines and that type of thing getting cheaper and cheaper and cheaper. I think the market will ultimately dictate what is best for Pennsylvania. I want to encourage all sources to participate in that and see where we wind up. But I’m very encouraged by what is happening in alternative energy generation and I hope we can continue to cultivate and encourage it here in Pennsylvania. Governor Wolf has continued to push for a severance tax on natural gas, which would impose a percentage on wellhead production. Pennsylvania has a per-well impact fee. Wolf wants the severance tax in order to raise more money from the industry and fund things like public education. Both Mango and Wagner are against changing the way the industry contributes to the state budget. Ellsworth says she’s against Wolf’s proposal, but has not completely ruled out a tax. Ellsworth: We talk past each other when we use the labels for the taxes. If we impose a tax that makes Pennsylvania less competitive, then businesses will go elsewhere, the gas will stay in the ground, and no one benefits. Any decision made on these issues is one that needs to be made in an open and candid conversation with everyone who has a stake in it – so that the conclusion is one that benefits Pennsylvania. Mango: Here’s why I’m against the severance tax. …We want the 150,000 manufacturing jobs from those sectors that consume a lot of energy. I believe we’re going to scare them, and we are scaring them away, with not only the severance tax but overly burdensome income taxes for corporations and overly burdensome regulations. And my fear is we only have five to seven years before this game is played out. Because Ohio has natural gas. West Virginia does, Louisiana does, North Dakota, Texas. We’re competing. And once these plants go in if you want a chemical or plastic… in western Pennsylvania we have the shale cracker plant, $6 billion dollar investment, right? I want three or four more of those. The problem is we’re driving them away once they put the $6 billion dollars into Texas or Louisiana or Ohio, it’s lost for a generation. So we need to move quickly. That’s why I’m avoiding a severance tax because I want all of the prosperity that can be created from the part of the economy that consumes energy. Wagner: Against it. We have an impact fee. And we are the only state in the country that has an impact fee, and there are other states that don’t have severance taxes. Natural gas pipelines have run into opposition across the state, where federal authorities have allowed companies to use eminent domain to seize private property. But nowhere are they more unpopular than in the Philadelphia suburbs, where densely populated communities worry about their safety and where Sunoco’s Mariner East 2 construction has left some homeowners without well water, and/or with sinkholes in their backyards. All three candidates support greater pipeline development. And all three pointed to a Russian liquefied natural gas shipment to New England this winter as a reason to continue building them in order to take advantage of the large domestic supply. Mango says the state has a role to play enforcing environmental laws when pipeline construction leads to environmental damage. Ellsworth: This is not a situation where energy is a luxury. It is also a geopolitical asset. We are fighting Russia. We ought to be making the case to Washington we ought to get it out of the ground and we ought to fight Russia with liquid natural gas, not our young men and women. Mango: We need to get the pipelines in. I know those are a little bit controversial but, you know, the federal government did approve them. I think the governor, appropriately, is intervening if they are violating any regulations as they are putting those pipelines in. If they’re damaging the environment, that’s what the government’s for, to stop them from doing it. But let’s get the pipelines in. Wagner: We need a pipeline running from east to west and north to south. We need to get the gas from the areas where it’s being generated to the areas that we’re using. … We have to get the infrastructure in place. Listen, we have the Pennsylvania Turnpike. We have lots of highways that are state highways that we could gain right-of-way access, we could put pipelines in [there]. StateImpact Pennsylvania reporter Susan Phillips, WITF reporter Katie Meyer and WHYY’s Dave Davies reported this story.